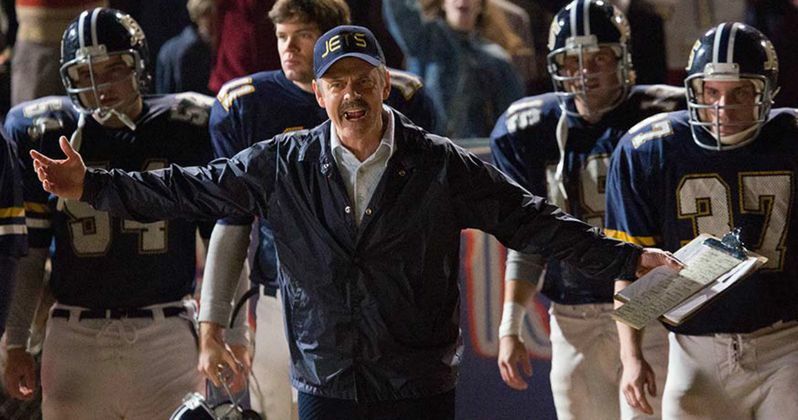 High school football coach Tandy Geralds (Nicholas Bishop) delivers a rousing motivational speech to his players, trying to get them to channel their anger into victory in our exclusive clip from Woodlawn, arriving in theaters October 16. This drama centers on a gifted high school football player who must learn to boldly embrace his talent and his faith as he battles racial tensions on and off the field. This moving and inspirational new film is based on the true story of how love and unity overcame hate and division in early 1970s Birmingham, Alabama. Woodlawn is set in 1973, where a spiritual awakening captures the hearts of the Woodlawn High School Football team. Lead by their coach, Tandy Geralds, and fueled by the team's dedication to love and unity in a school filled with racism and hate, the team makes an astounding run at the playoffs, leading to the largest high school football game ever played in the torn city of Birmingham, Alabama, and the rise of it's first African American superstar - Tony Nathan. Tony Nathan (newcomer Caleb Castille) lands in a powder keg of anger and violence when he joins fellow African-American students at Woodlawn High School after its government-mandated desegregation in 1973. The Woodlawn Colonels football team is a microcosm of the problems at the school and in the city, which erupts in cross burnings and riots. Coach Tandy Gerelds (Nicholas Bishop) is at a loss to solve these unprecedented challenges with his disciplinarian ways. It's only when Hank (Sean Astin), an outsider who has been radically affected by the message of hope and love he experienced at a Christian revival meeting, convinces Coach Gerelds to let him speak to the team that something truly remarkable begins to happen. More than 40 players, nearly the entire team, black and white, give their lives over to the "better way" Hank tells them is possible through following Jesus. The change is so profound in them it affects their coach, their school and their community in ways no one could have imagined. The supporting cast of Woodlawn includes Jon Voight, who plays legendary University of Alabama head coach Paul "Bear" Bryant, C. Thomas Howell, Virginia Williams, Brando Eaton, Sherri Shepherd, Nicholas Bishop and Rhoda Griffis. Directed by Andrew Erwin and Jon Erwin, Woodlawn will go up against Sony's Goosebumps, Universal's Crimson Peak and DreamWorks' Bridge of Spies in theaters this weekend, so we'll have to wait and see if this inspirational true story drama can compete with those new releases at the box office. Until then, check out our exclusive clip from Woodlawn below.